Wordless Wednesday ~ My Wedding Anniversary this Thursday! | The Happy Wonderer ~ ellen b.
Wordless Wednesday ~ My Wedding Anniversary this Thursday! Posted on December 4, 2007 by Ellen •	This entry was posted in Anniversary, California, Heritage, History, Los Angeles, Wordless Wednesday. Bookmark the permalink. Congratulations on your 33rd Anniversary!! You two look so darn cute together! David’s and mine will also be 33 years this next summer…. Hope the house is drying out fast! cheers to 33 years and beyond!!! What a great picture! You both look so happy! Happy Anniversary! What a lovely picture. You both have beautiful smiles. Happy, happy 33rd anniversary! The smiles on your faces tell it all, then and now. May God continue to bless you, for His glory. Congrats on your anniversary. What a lovely photo!! you guys make a very beautiful couple!! Happy anniversary. Happy Anniversary! Happy Anniversary # 33! BTW, the link (you were first) doesn’t get to you. Perhaps you did it again, I just went to your blog and didn’t try to look for more. Forgot, I wanted to mention Mrs. Jim and I are on year 34 now, 35 will be next February. Happy Anniversary! You look good together 😉 Thanks for stopping by. Happy WW! Wow! 33 years…congratulations and happy anniversary. Happy Anniversary!! If you knew then, what you know now? Congratulations on your wedding anniversary. Have a wonderful day! Congratulations, Ellen and Dear, on your 33rd wedding anniversary! That is truly wonderful. And I sense that you are both still as happy and in love as you looked in the wedding photo (maybe even more so). Wow 33 years, have a great anniversary! Oh my God! You both look so young and beautiful! What a lovely picture! Here is to your next 33rd anniversary! Congratulations, ellen! All the best to you and hubby! Congrats to you and your DH! Happy WW! Happy Anniversary and God’s blessings for many many more! Happy WW! That’s great! Happy Anniversary and Happy WW too! Wow! nice post, keep it up!!! WOW! That’s awesome – Happy Anniversary! Great shot. Happy Anniversary a day early. Congratulations and may you have many more happy years together. Aw! Happy anniversary and to many, many more years of happy memories! Happy anniversary! What a great pic! 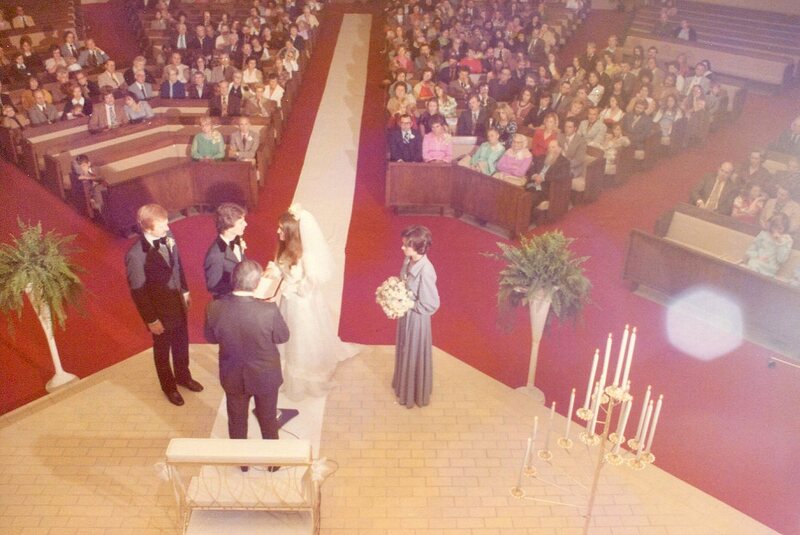 Great picture – happy anniversary! Congratulations and Happy Anniversary! I hope some day to celebrate 30 years with my husband. 21+ years to go. What a memorable photo. Happy Anniversary! Happy Anniversary to both of you! How great that you still have this photo — and that you shared it with the rest of us, too. What a lovely pic. Happy anniversary! Look at that tie! 😉 Happy anniversary! What a cute couple you were (or still are, lol ) Happy anniversary !! happy anniversary – thanks for visiting me. Wow 33 years, congrats! We just celebrated 8 years and look forward to many more. I thought that hairstyle and clothing style looked familiar. I will be married 34 years in February. Were you like 18 in that photo?! Happy Anniversary! Congratualtions! Oh, those styles bring back memories. Congrats! That’s a long time. May you have 33+ more years together! Congrats from Back Chat and Simone’s Butterfly. Awww you were so young! 🙂 Happy Anniversary! Happy WW and happy 33rd. You’ve been together as long as my parents! 🙂 I hope that doesn’t make you feel too old! Happy anniversary! Congratulations on thirty-three years! may your love for each other grow more and more!